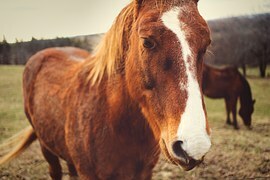 When a horse bites someone, it can cause a lot of problems if they injure the person and the person is not familiar with horse behaviors. When an animal bites, many people take that as an act of aggression but in many cases, a horse biting is its last resort when it feels threatened. Most horses will try to flee or kick before they bite. As a result, if you are homeowner, it is important to recognize the signs for when your horse feels threatened. If you are bringing your horse around people, especially people who are not familiar with horses, it is essential you educate them before allowing your horse near. An important concept to understand and teach is the concept of determining whether your horse is biting or nipping. When a horse wants to bite out of aggression, it usually is very easy to read that. However, horses are natural grazers and as a result, they utilize all their senses to explore their surroundings. This way of exploration can also sometimes include nipping. While nipping is unacceptable and should be corrected, it is also important to remember that there is a distinct difference between a bite and a nip. Both behaviors can be prevented with proper training and the more time you spend with your horse, you will be able to read these signs. To learn more about horses and other livestock, please refer to our blog often! If you are interested in high quality animal life insurance, give the professionals at Ark Agency a call at (320)243-7250 or (800)328-8894, today.